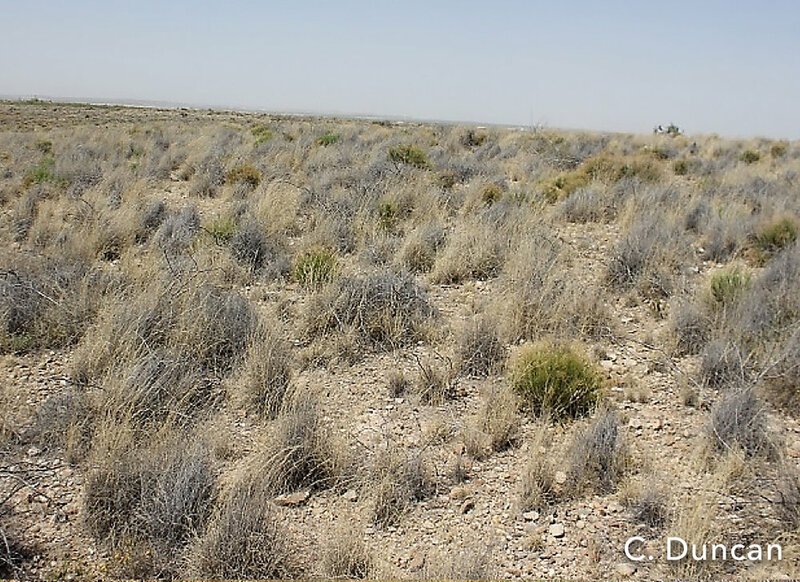 IN THE CHIHUAHUAN DESERT of southeastern New Mexico, a group of committed rangeland specialists, conservationists, ranchers, and biologists are restoring historical grasslands and improving riparian habitat on a landscape scale. It didn’t always look this way. Historic overuse of the land transformed desert grasslands into land dominated by woody shrubs. The introduction of saltcedar and Russian olive along rivers and streams changed the ecology and biodiversity of riparian areas, resulting in impacts to wildlife habitat and livestock grazing, and reduced water quality and quantity. The BLM recognized that successful restoration of entire watersheds couldn’t be accomplished without partnering with state and local governments, other federal agencies, industry, private landowners, and conservation groups. The statewide Restore New Mexico initiative (Sidebar) provided the framework and financial incentive to bring public and private partners together. Judy Bock is District Manager with the Carlsbad Soil and Water Conservation District (SWCD), a key partner in the southeastern project area. “Developing partnerships between private and public land managers allows us to work across ownership boundaries and restore areas on a landscape scale,” she explains. Saltcedar and Russian olive removal on the Black River in 2006. Photo courtesy Bureau of Land Management. Black River 12 years following restoration. The project area in southeastern New Mexico encompasses about 6.5 million acres of rangeland in a four-county area. Herbicide application, mechanical removal, biological control, prescribed fire, and reseeding have been implemented to restore about 1.5 million acres. Riparian Restoration—23,000 acres: Saltcedar was reported along the Pecos River in the early 1900s. The invasive plant spread to infest most riparian areas and tributaries, including the Black and Delaware rivers in the Pecos district. Herbicide application, followed by prescribed fire and mechanical removal, restored about 23,000 acres of saltcedar- and Russian olive-dominated riparian habitat in the project area. Saltcedar reinvasion on the Pecos River floodplain prior to treatment (TOP) and two weeks following application of Garlon® 3A specialty herbicide (ABOVE). Keller says annual maintenance is critical to control reinvading saltcedar and Russian olive, especially after flood events. Each year, hired contract crews apply Garlon® 3A specialty herbicide on young saltcedar and Russian olive trees. Although the saltcedar leaf beetle (Diorhabda sp.) was released and established along several tributaries, the insect has not significantly impacted saltcedar density. “The same area that cost about $1500 an acre to restore with mechanical removal at the start of our project can now be done in about half a day with backpack herbicide applications,” explains Keller. Upland Restoration—1,451,000 acres: Creosote and mesquite encroachment on arid rangeland increased greatly the past 100 years and dominates most upland sites in southeastern New Mexico. As part of the restoration program, Spike® 20P herbicide has been applied to about 400,000 acres of creosote-dominated lands, reducing brush density by about 90 percent and allowing native grasses to return. Data from field trials show that creosote control will last more than 25 years under proper management, supporting long-term management goals for the invasive shrub. Creosote- and mesquite-dominated upland (top) compared to adjacent area treated with Spike® 20P herbicide at 0.75 pounds per acre (above). Photo above is taken about 10 years after herbicide application. Mesquite-dominated lands are treated with Sendero® herbicide or a combination of Sendero and Remedy®Ultra herbicide. To date, about 850,000 acres of mesquite have been treated, with control ranging from 65 to 90 percent, depending on rainfall, mesquite structure, and site conditions. Western honey mesquite (Prosopis glandulosa var. torreyana), the common mesquite in southeastern New Mexico, is very difficult to kill. Historically control was rarely above 20 percent. The combination of Sendero plus Remedy Ultra is changing that paradigm. Prescribed fire has also been used to restore lands with encroaching woody plants. About 160,000 acres have been burned to remove juniper and other invasive woody vegetation and maintain desirable grasses. Removal of brush competition enables native perennial grasses to reestablish from seed or remnant plants. “We can increase grass production from about 50 pounds per acre on a creosote-dominated site to about 450 pounds per acre once woody shrub density is reduced and grasses have reestablished,” says Keller. Replacing shrub-dominated sites with grasses reduces surface runoff and erosion, improves wildlife habitat, and increases forage production for livestock. African rue (Peganum harmala) and malta starthisle (Centaurea melitensis) are the two most common noxious weeds in the project area, with about 41,000 acres treated since 2005. “Both of these weeds are closely tied to disturbed areas along haul roads and drill pads in the oil-rich Permian Basin,” explains Keller. The oil and gas industry is a project partner contributing resources to both noxious weed management and other restoration efforts. Partners share restoration costs. The BLM, Natural Resource Conservation Service, and private interests each contribute about a third of the total cost of projects. Restoration costs average about $35 per acre. Restoration is a long-term process, and managing livestock is a critical component of the partnership. Livestock grazing is allowed on much of the land in the program. As part of their commitment, ranchers agree to defer grazing for at least two growing seasons following treatment, to allow grasses to recover. The Restore initiative has given diverse partners a unique opportunity to collaborate in ways they never have before. The uniting force behind the partnership is a shared vision for restoring the land, which ultimately benefits soil and water resources, wildlife, livestock, and the many stakeholders who call southeastern New Mexico home. Ray Keller retired from BLM July 3, 2018. He continues to work on the Restore New Mexico project as an employee of the Carlsbad Soil and Water Conservation District. Ray and Judy can be reached by calling 575-628-1532. Juen, Jesse. Retired State Director, Bureau of Land Management. Personal communication. State restrictions on the sale and use of Remedy Ultra herbicide apply. Consult the label before purchase or use for full details. Sendero herbicide is not registered for sale or use in all states. Contact your state pesticide regulatory agency to determine if a product is registered for sale or use in your state.